No. 99, Jalan Metro Perdana Barat 12, Kawasan Perindustrian Sri Edaran, 52100 Kepong, Kuala Lumpur, Malaysia. 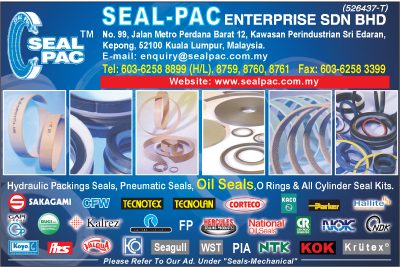 The Seal-Pac Enterprise Sdn Bhd is one of the leading distributors of high quality Hydraulic and pneumatic sealing products marketed under the “SEALPAC” trade name. Seal-Pac Enterprise Sdn Bhd has expanded rapidly since its formation in 1996, and continues to develop. 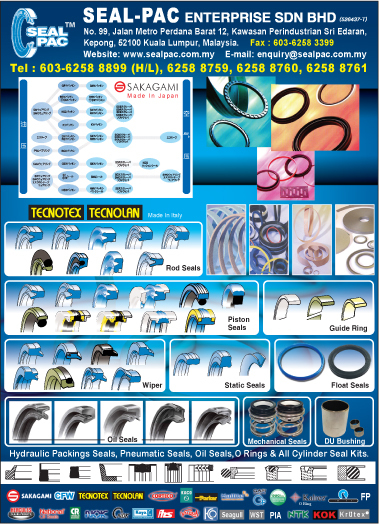 Italy, Germany, US, UK, Japan and Taiwan are a few of the countries that we deal with, when it comes to top quality seals. The constant development of products has made SEALPAC not only a market leader but unique for the extensive range of products we have. We are ideally equipped to meet the demands of today sealing technology and building upon a foundation of excellence ensures that we will continue to be capable of meeting the future demands of the hydraulic and pneumatic industry.